Anyone who knows me knows that i'm inspired by all things worldly. I love the idea of freeing your mind, or feeling a sense of escape through spending some time in a beautiful setting. Since having Noah, my husband and I’s traveling bucket-list has been rewritten with Noah included in a majority of our travel plans. We traveled from Los Angeles to New York with him twice actually - once when he was six months and once again when he had just turned one. I would actually highly recommend that time for most parents as kids are very observant and go with the flow at that time. As soon as he is of a good travel age, Noah will be joining us in everything. What better way to learn about the way the world works by going to see it for yourself? Kids are like a sponge and Caleb and I both believe that exposing him to traveling early would be so refreshing for us all. Currently key factors such as shots, his age (almost at terrible twos), safety, and his comfort are big determining factors for why it is not time yet. Despite the pause in long distance travels we have made it a point to discover what destinations are nearby us. Imagine being in your own backyard and suddenly feeling as if you were on the other side of the world. This weekend we visited BAPS Shri Swaminarayan Mandir. 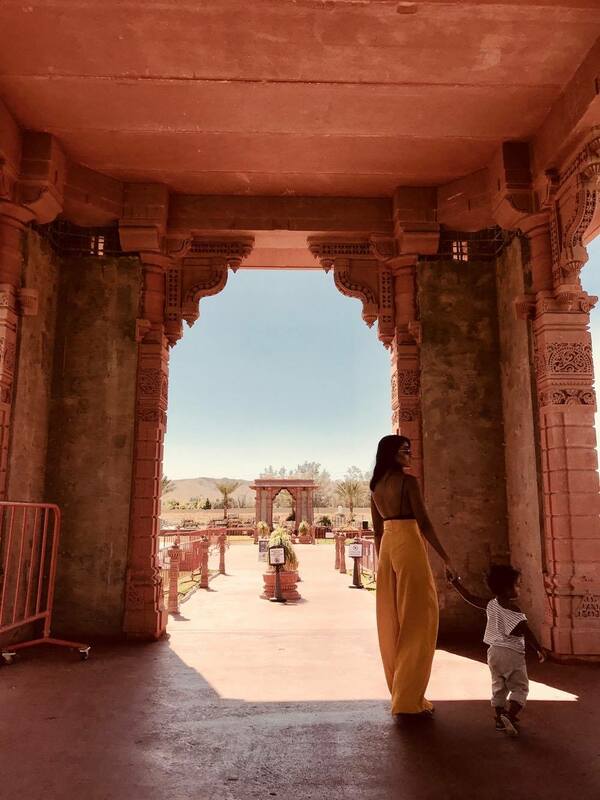 After years of hearing about it, we finally took a moment to travel to this hidden gem, located 45 minutes outside of Los Angeles, in Chino Hills. BAPS Shri Swaminarayan Mandir, is one of the largest Hindu temples located within North America. Such a majestic landmark of course took some time to be built. Plans to build the temple began in the 90s and the temple officially was completed in 2012. 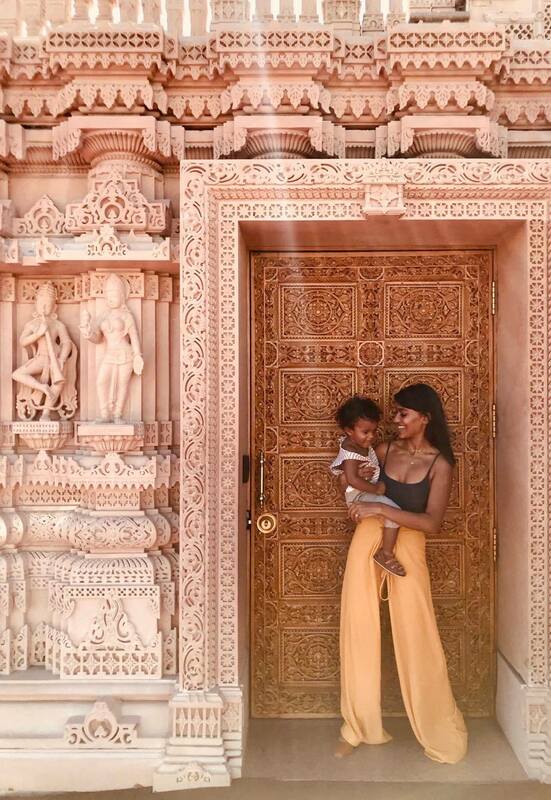 I remember the story behind this temple made it one I had to visit -- each piece was hand carved in Indian Pink sandstone and Italian Carrara marble by artisans in India, depicting tales of inspiration, history, and devotion and then ultimately being brought to its destination in Chino Hills. I am so happy we got to visit this destination and that it is so close to us for future visits. Noah, Caleb, and I were all equally mesmerized by the entire temple but especially once we went inside. I would especially recommend this destination for a day trip. The temple allows limited photography throughout the exteriors, while photography is banned inside the temple. Being that this is a spiritual space there is a dress code and they ask that women especially dress modestly. If you come in clothing that goes against their guidelines they will provide you with fabric to wear when inside the temple. The staff is very welcoming and excited to share their culture with you. There is no fee to attend.